The Caribbean isn’t just for sun-seekers and pool-side nappers. Adventurous travellers shouldn’t overlook the miles of hiking trails spread among some of the Caribbean’s most beautiful islands. Here are seven great hikes in the Caribbean for the active vacationer. When you think of a Caribbean vacation, hiking may not be the first activity that springs to mind. But elegant crescents of sugary sand are not the region’s only natural enticement. The voluptuous contours of many Caribbean islands are a hiker’s dream. Add a vivid tropical landscape, exotic flora and fauna, and that dazzling juxtaposition of azure sea and sky, and a hiking holiday in the Caribbean makes perfect sense. Here is a sampling of some of the best hikes, treks, and walks in the Caribbean. The Caribbean island of Saba is one big volcanic peak, a pyramid of craggy grey rock jutting out of the shimmering blue sea. Access roads and hiking trails ring the mossy slopes. Out of the island’s centre rises Mount Scenery at 3,000 feet. You can hike one of several trails that loop the mountain or climb the 1,064 hand-hewn steps of the Mount Scenery stairway to the top, passing rare orchids and black-eyed Susans as you go. This three-hour-roundtrip hike starts near the Trail Shop in Windwardside and passes through lush rainforest, with panoramic views of turquoise seas and neighbouring islands St. Kitts and St. Maarten. Mist swirls around the peak’s lava dome, which last erupted in 1640. Download a trail map online or arrange a guided walk at the Saba Tourist Office. Dominica With some of the Caribbean’s loftiest peaks and wildest jungles, Dominica rewards adventure exploration with unforgettable natural sights. Hardy souls and seasoned hikers take to the hills and dense jungle to glimpse bubbling hot springs and barren wastelands (the Valley of Destruction). You can hike to Boiling Lake, the world’s second-largest solfatara lake, a flooded volcanic fumarole where water temperatures hover around 190 degrees. The challenging seven-hour roundtrip hike to Boiling Lake is recommended for experienced hikers only. Contact Ken’s Hinterland Adventure Tours or Antours for guided trips on your hiking holiday. 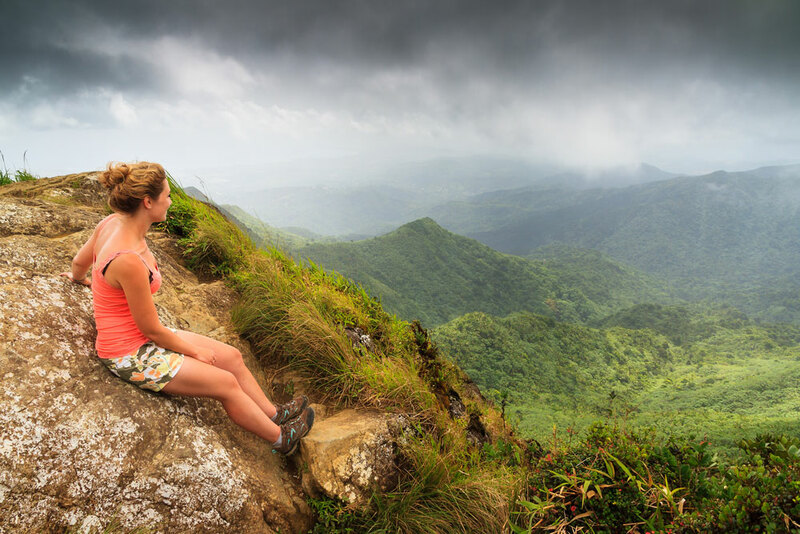 Trinidad offers some of the most invigorating hiking in the Caribbean. Trekkers on the island can follow rugged trails to river gorges, pool basins, and shimmering waterfalls deep in the wilds of rainforest jungle. Sign on with Hike Seekers to trek to and through narrow Guanapo Gorge or to tumbling Angel Falls. Hike Seekers offers adventures hikes for all levels: easy, moderate, and challenging. Pay no attention to the glitz on parade in high season on St. Barts. The dramatic contours of this celebrated island are far more glamorous than any B-list celeb in a string bikini. St. Barths’ two official hiking trails both lead to beautiful Colombier Beach, overseen by David Rockefeller’s former Jetsons-style home high on a bluff. Stroll the 20-minute trail from Flamands Beach or take to the 40-minute cliff-side trek on a winding goat path to the placid blue cove dotted with sailboats. The beach is the perfect spot for a swim or snorkel in warm Caribbean seas and relaxing after such a satisfying hike. The island ridge known as the Barre de l’Isle is the bony backbone that separates the eastern and western halves of St. Lucia. A 30-minute drive from Castries, the Barre de l’Isle Trail traces the ridge on a moderately easy hike that follows the perimeter of the island’s sumptuous tropical rainforest, with viewpoints along the way that open up to panoramic sea vistas and glimpses of emerald valleys below. Intrepid hikers can continue for the steep one-hour climb to the summit of Mount Lacombe. Download a self-defence guided brochure and map from the St. Lucia Forestry Department under “Forestry” at malff.com. Thousands of years of volcanic activity provide the backstory to many a Caribbean hiking holiday. An evergreen seasonal forest blooms like a flower inside the crater of the extinct stratovolcano known as the Quill; it’s located in Quill National Park and is St. Eustatius’ highest point. The park itself is a lush garden of dew-kissed wild orchids, begonias, elephant-ear ferns, and mahogany trees. Of the eight different trails that circle the Quill, the Crater Trail is the challenging 90-minute roundtrip journey that leads hikers from the rim of the Quill into the crater bottom. Go to statiapark.org for trail maps and hike descriptions. Here’s a nice little urban trek you don’t have to dive into the wilds to access. This steep climb begins in the bustling harbour-side village of Marigot. Exactly 114 stone steps lead up to the ruins of Fort Louis, built by the French on one of the island’s highest hills in 1789. The stone steps start just to the right of L’Oizeau restaurant and lead to a parking lot at the Sous Préfecture (at the foot of the fort). From the top, visitors are rewarded with 180-degree vistas of Marigot, Simpson Bay lagoon, and most of the St. Maarten coast, with the island of Anguilla in the background.